So apparently, the state doesn’t care about us anymore. In an interview on Feb. 22, UC Berkeley Chancellor Robert Birgeneau explained exactly why he believes that Berkeley is becoming a “federal” rather than a state institution. When Birgeneau started at Berkeley, the state provided $450 million of the school’s budget. That number has decreased to $300 million dollars and will likely drop to $225 next year. Student fees provided $150 million in revenue at the time of Birgeneau’s beginning, with the total number rising to $340 million this coming year. Birgeneau emphasizes the importance of federal research funding and state that Berkeley will still carry out its commitment to lower-income students. Hopefully the federal government won’t abandon us too. 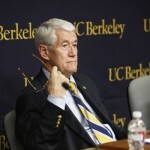 Cal Chancellor spends $300,000 for lectures by ex Michigan governor. Stand up for University of California and California.